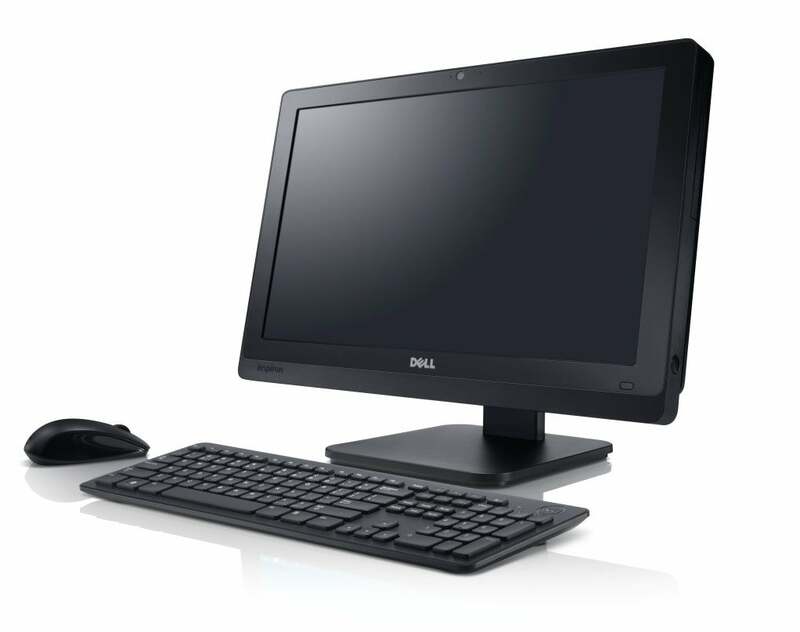 I’m a big fan of Dell’s Inspiron One lineup of all-in-one PCs. These computers manage to be gorgeous, sturdy, and versatile while remaining relatively budget friendly. The Inspiron One 20 reviewed here has a smaller display than the Toshiba, but it costs more than $300 cheaper ($699 as of 8/29/13). It’s equipped with an Intel Core i3-3240T processor; 4GB of DDR3/1600 memory; and a 1TB, 7200rpm hard drive. It also has built-in Bluetooth and Wi-Fi adapters, and a 20-inch capacitive touchscreen. Design-wise, the Inspiron One 20 Touch is tough to beat, though the Toshiba PX35t-A2210 has a slightly more premium look. This all-black AIO features an edge-to-edge glass screen, which gives it a bezel-less appearance and also makes for easy swiping when performing common Windows 8 gestures (such as swiping from the side to pull up the charms bar). The minimalist bezel sports a small, mirrored Dell logo at the bottom and a built-in webcam at the top. The system’s speakers are just below the screen. There are no buttons or ports on the front of the One 20 Touch, these are all relegated to the system’s sides and back. Dell's Inspiron One 20 Touch boasts a great design, but its performance leaves a bit to be desired. The One 20 Touch’s great-looking design is slightly marred by its below-average peripherals. The system comes with a wired mouse and keyboard, both of which are utterly basic (though mostly comfortable to use). The keyboard offers very light tactile feedback, which can make accurate typing difficult. The mouse is large but comfortable, and offers an average input experience. As for performance, the Inspiron One 20 Touch is good, but not great. It will get you through schoolwork and basic entertainment, such as streaming HD movies and playing music, but it won’t handle PC games or media-editing software very well. This Inspiron scores a very average 109 on WorldBench 8.1, which means it’s just nine percent faster than our Acer baseline model . Compared with the other AIOs in this roundup, the One 20 Touch is solidly in the middle – it comes in fourth, but it’s just one point below our third-ranked HP Pavilion TouchSmart 23 (110). PCWorld's Desktop Worldbench 8.1 benchmark suite measures performance with a number of productivity, creation, and entertainment programs. In our graphics tests, the One 20 Touch performed as expected: It managed a playable, if far from excellent, 30.7 frames per second on our Dirt Showdown test, and but only 14.8 fps with the more demanding BioShock Infinite (with both games, resolution was set to 1024 by 768 pixels, and image quality was set to Low). In other words, it can handle low-end PC games at an acceptable frame rate, but it’s about as far from a gaming powerhouse as a Commodore 64. HD video looks just okay—there’s quite a bit of artifacting and foreign objects in scenes with a medium amount of motion—and skin tones have a tendency to look burnt and oversaturated. Audio is also somewhat disappointing: The speakers aren’t very loud, and music lacks depth, even when all the software enhancements are turned on. 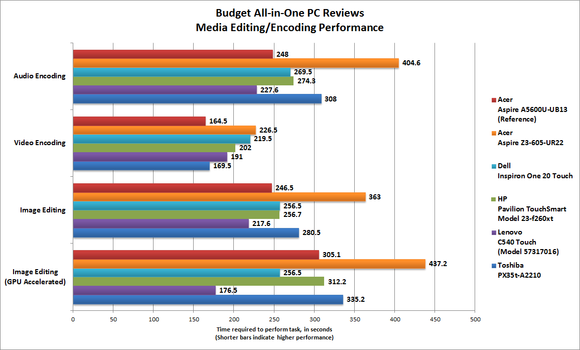 This chart indicates how well each all-in-one PC performed with a variety of media editing and encoding tasks. If this is an important consideration for your,the PCs with the shorter bars are your best choices. The Dell Inspiron One 20 Touch is a nice starter machine for those who like the Inspiron One look and feel. The touchscreen remains one of the better touchscreens that I’ve used, with smooth, accurate touch and a nice glidey feel to the glossy display. I especially like the adjustable stand, the minimalist design, and the overall sturdiness of the chassis. But it has its issues, including cheap, basic peripherals; mediocre performance; and weak speakers. Editor's note: This all-in-one was reviewed as part of a roundup for back-to-school season. You can read that story, along with reviews of the five all-in-ones we compared it to, here. The Dell Inspiron One is a sturdy, non-nonsense all-in-one. 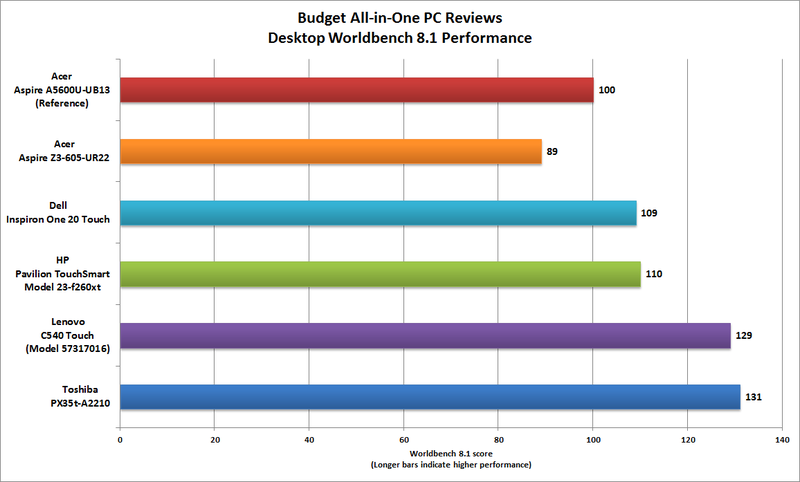 But Dell's ho-hum component choices deliver equally ho-hum benchmark performance.